Co-directors Robert Rodriguez and Frank Miller reunite to bring Miller's visually stunning Sin City graphic novels back to the screen in 'Sin City: A Dame To Kill For'. Eva Green stars as Ava, a temptress who enlists Dwight McCarthy (Josh Brolin) in a bid to escape her ex-husband. Joseph Gordon-Levitt plays Johnny, a mysterious gambler set on taking down his sworn enemy in a high stakes game of life and death. Weaving together two of Miller's classic stories with new tales, the town's most hard boiled citizens cross paths with some of its more notorious inhabitants. Newcomers Juno Temple and Jeremy Piven join the all-star cast including Mickey Rourke, Bruce Willis, Rosario Dawson, Jessica Alba, and Jaime King who will be making their return to 'Sin City: A Dame To Kill For'. The 'Sin City: A Dame To Kill For' competition has now closed. Winners will be announced shortly. Competition opens at 5pm AEST on Wednesday 10th September 2014 and closes at 11:59pm AEST on Wednesday 17th September 2014. Five winners will be chosen at random on Thursday 18th September 2014. To successfully win, entrants must fulfil the above entry conditions before the time the competition closes. Current members/followers are eligible to enter the competition. Only one entry per person. Only one winner per household. To be a valid winner, the entrant must not have won a prize from SWITCH within the last 28 days. 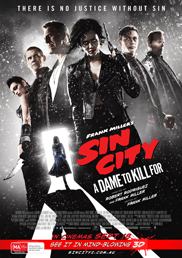 Each winner will receive one double pass to 'Sin City: A Dame To Kill For'. By entering, you agree to receive occasional emails from SWITCH in the future. If you decide to unsubscribe from these updates, any further entries will not be applicable. Only Australian residents are eligible to enter. 'Sin City: A Dame To Kill For' is in cinemas from Thursday the 18th September 2014 through Icon.